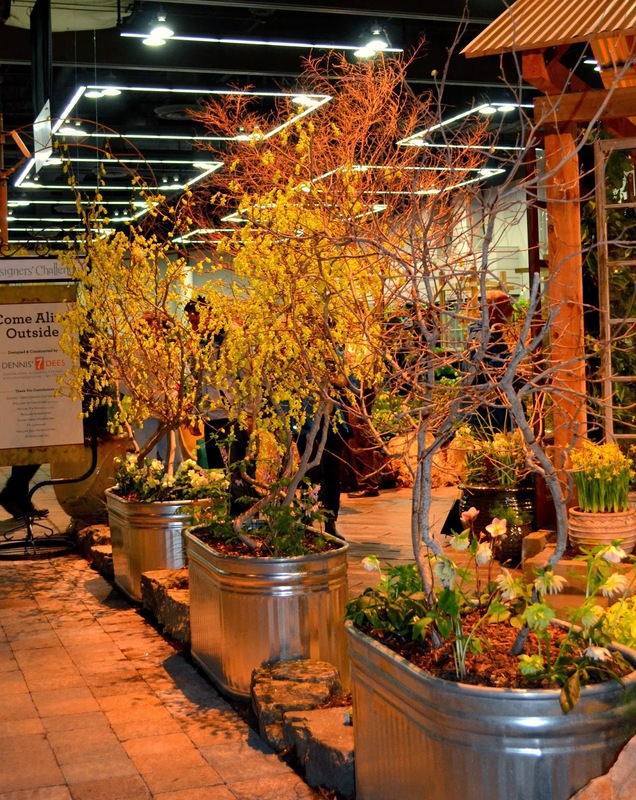 The 2014, Portland Yard, Garden & Patio show, held in February is a tough month to have a large selection of plants to work from for the Design Challenges. I tend to see the same plants used throughout (Hellebores) but here are a few that I thought were exciting and even a few that were new to me. Spring Promise Double Hellebore and Tulips. 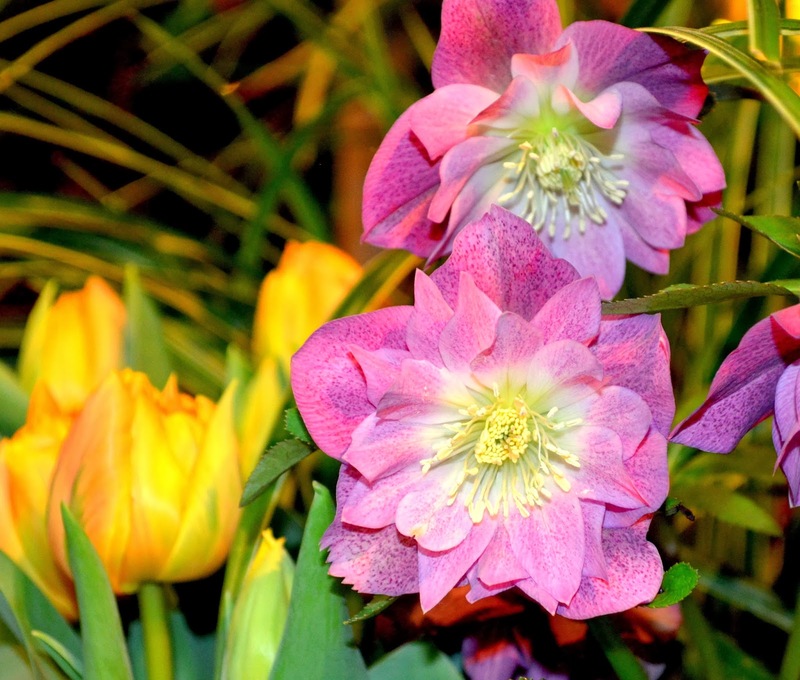 Hellebores were a favorite choice for most displays. 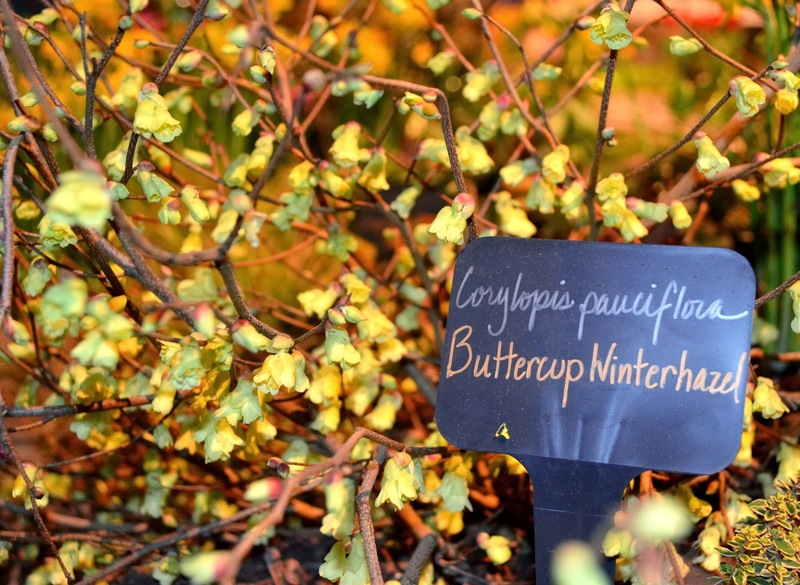 Dennis 7 Dee's used Buttercup Winter Hazel in it's display. Lovely blooms in a nice, compact form. They also used Spike Winter Hazel in stainless steel water troughs. I thought the effect was beautiful. Tall and elegant. While not new, 7 Dee's also included Chief Joseph Lodgepole pine. It's just so pretty. I can't help it. It popped out in the display like a golden torch of light. Another tree that I was unfamiliar with was Larix Kampferi 'Diana'. 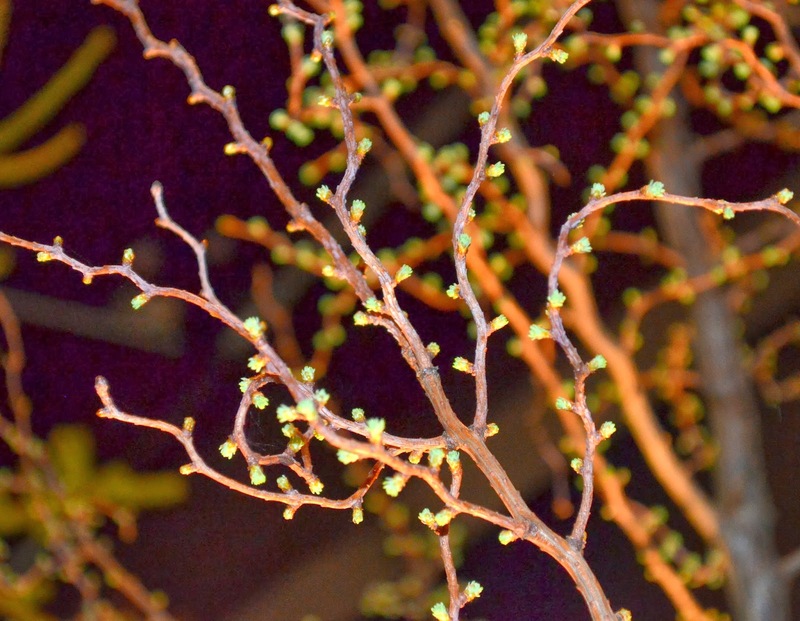 The buds were just beginning to pop a little green on the spare branches. 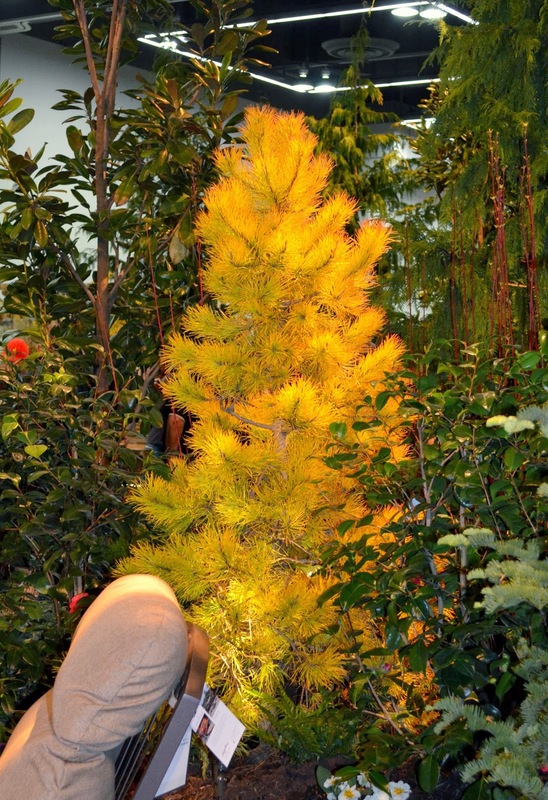 I spoke with the owner of Oregon Small Tree's, who contributed nursery stock to the display where I found this conifer tree and he had nothing but praise for this rare beauty. I am ready to bring it home. Oh, did I mention I have a thing for conifers? 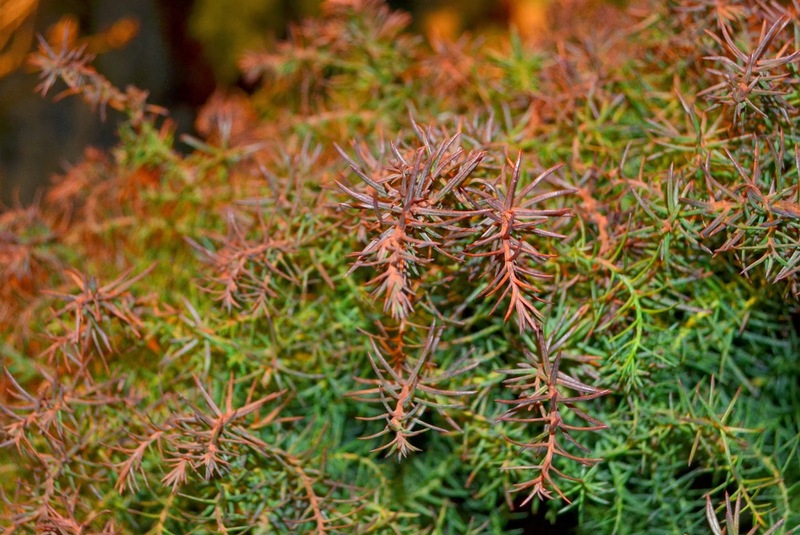 And lastly, Mushroom Japanese Cedar. Great winter color. While I didn't find much that wow'd me plant wise at the display gardens, I did fall in love, all over again, with ferns during the Ferns of the Northwest seminar I attended. I love the seminars of the Yard, Garden and Patio show. I learn so much. 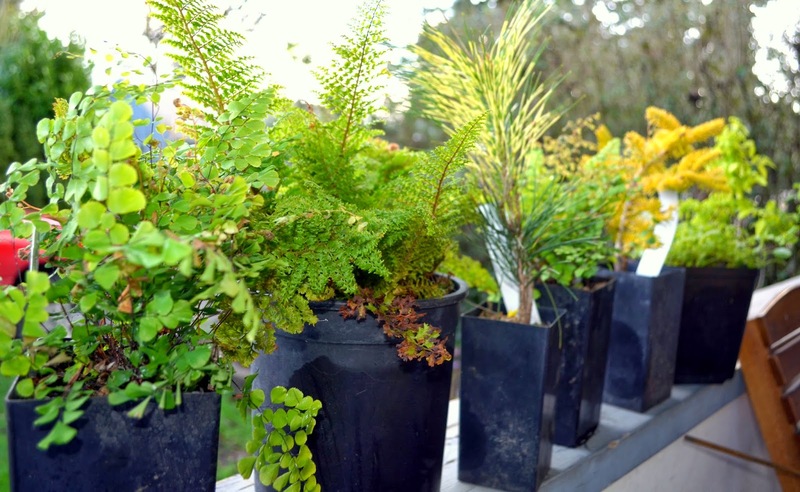 After the show, I nearly ran to the Green Market to purchase all Himalayan Maidenhair ferns in site. Thank you Cistus for having them in stock! Here's my loot from the show. Fun show and even better, meeting fellow Garden Bloggers, Heather and Jane for lunch! I love ferns too! 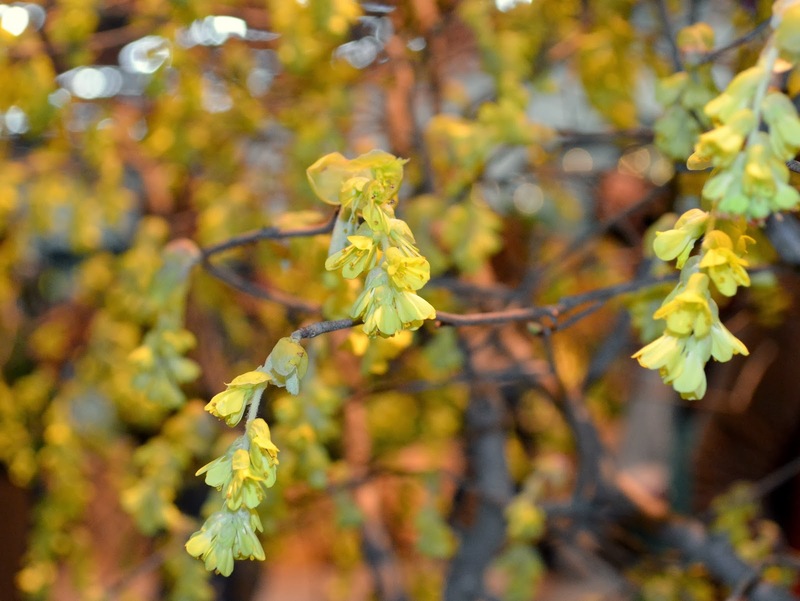 And that Corylopsis really stood out for me too, in that display. They were all right at the peak of bloom. Lunch was the highlight of my trip to Portland as well. Good for you focusing on the plants. They mostly take a back seat to the dramatic staging. 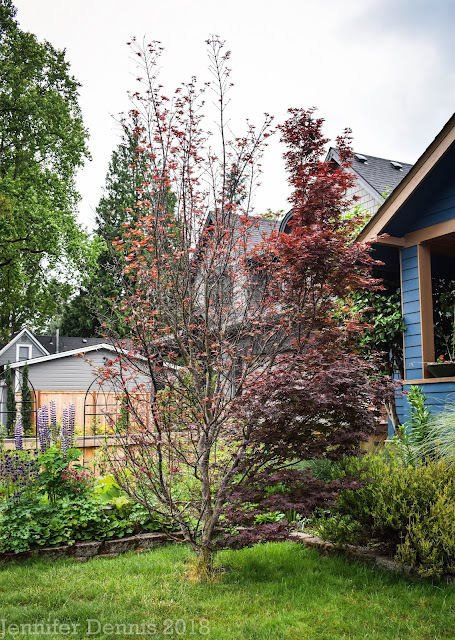 I've been in love with Larches for some time, but rarely see them for sale. I think that might be changing, so maybe the prices will begin to come down too. I had a Larix Kampferi for a few years , I loved the pearly metallic buds . I made the mistake of moving it from a pot into the ground in the middle of summer…. killed it, I felt so bad . Really lovely photos, looks like Spring is on its way. So wonderful to see the photos of the garden show. We don't have anything like that here really. Someday I'll go to the big one in Toronto though. Thanks for posting this. What fun! And you did indeed score some major loot. I love them all. A great haul! I'm looking forward to attending the YGP show again next year!